Body camera video released by the Vallejo Police Department on Friday shows the moments that led up to the shooting of 20-year-old Willie McCoy. Cheryl Hurd repots. 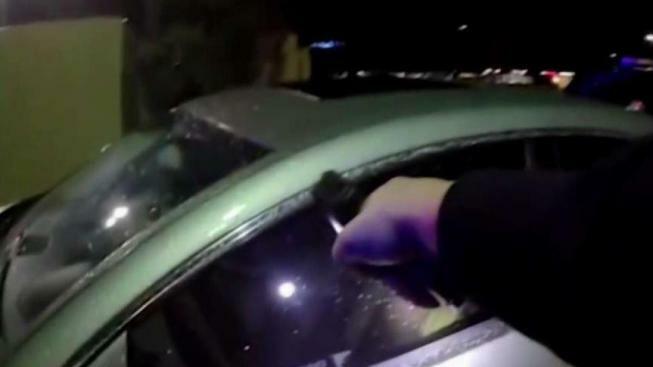 Police in Northern California on Friday released body camera video of the fatal shooting last month of a man in the drive-thru lane of a fast food restaurant. The nearly 30-minute video released by the Vallejo Police Department shows the Feb. 9 shooting by six police officers of 21-year-old Willie McCoy. The video includes the original 911 call recording from a Taco Bell employee who says a driver is passed out in his car. It also shows McCoy with his head slumped to his left and several officers standing next to his car with guns drawn. McCoy can be seen scratching his left shoulder, then sitting up and turning away from the officers who are yelling for him to show them his hands. Seconds later, the officers open fire. Police said after the shooting that McCoy, a local rapper known as Willie Bo with the group FBG, abruptly moved and officers ordered him to keep his hands visible, but he reached for his gun and officers opened fire. In a statement posted in the video, the department said that "the public should be aware that the body cameras do not always reflect what the officer's eyes see." John Burris, the attorney for McCoy's family, said officers failed to establish a plan of action to safely remove McCoy from the car. "Nothing in that video warranted those officers shooting Willie McCoy dozens of times," Burris said. Willie McCoy was fatally shot by California police officers on Feb. 9, 2019. WARNING: THIS VIDEO CONTAINS GRAPHIC FOOTAGE OF THE SHOOTING FROM THE OFFICER'S PERSPECTIVE. The video was produced and edited by the Vallejo Police Department, and was published on the City of Vallejo's YouTube page.